Another year, another NRF Convention and Expo in the books, and as much as mobile and social media were trends this year, there remained a concentration on the foundation of retail, customer service. Customer-centricity was the buzz word and it could be seen everywhere. It was clear the new technologies at the show served to enhance the customer experience. At Irisys, the idea of improving the customer experience is nothing new. Our booth was busy with activity as retailers and vendors alike stopped by to learn how our People Counting and Queue Management solutions could help retail outlets not only gain valuable customer analytics but also improve their overall customer relations. With Mark Ryski – author of Conversion: The Last Great Retail Metric – signing autographs at our booth, retailers were enthusiastic to learn more about the importance of traffic and conversion analytics and how it can help reduce expenses and improve sales. 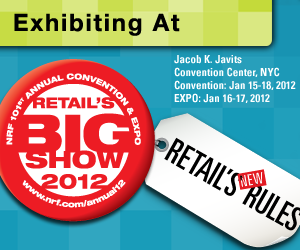 Over the next couple of weeks on this blog, we will take a look back at the 2012 NRF Annual Convention and Expo and explore some of the trends and share some of the conversations we had surrounding customer service.